Conor McGregor still wants his rematch with Khabib Nurmagomedov and he wants it so bad he suggested that new interim lightweight champion Dustin Poirier should face Nate Diaz next instead. 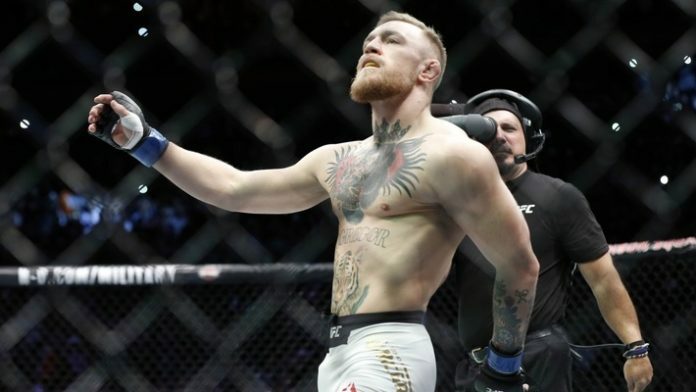 Conor McGregor sent out a message of congratulations to new UFC interim lightweight champion Dustin Poirier on Saturday night after he earned a unanimous decision win over Max Holloway in the UFC 236 main event. The championship belt served as a reward for a lifetime of blood, sweat and tears that Poirier has put into his career while competing at both featherweight and lightweight. Most recently, Poirier has put together in incredibly impressive string of wins together including TKO performances against former UFC champions Eddie Alvarez and Anthony Pettis as well as finishing Justin Gaethje before earning the shot at the interim belt this weekend. Poirier showcased a ton of power, heart and determination to get past Holloway, who was riding a 13-fight winning streak going into their fight. Following the win that crowned him champion, McGregor offered praise to Poirier for his performance and then made an odd suggestion for his next fight. “Amazing main event fights. How fighting should be! Max you are insanely tough! Please rest up now young Uce, you are a warrior head to toe! A champion FOREVER,” McGregor wrote on Twitter. Poirier was previously scheduled to face Diaz last November before the bout was scrapped due to injury and contract negotiations. McGregor’s suggestion that Poirier should fight Diaz is his way of trying to land a rematch with reigning lightweight champion Khabib Nurmagomedov, who defeated him by rear naked choke last October. McGregor has coveted the opportunity to face Nurmagomedov again but for as much as he wants that fight, he’s likely going to have to sit and wait until after Poirier gets his chance to unify the titles first. UFC president Dana White assured Poirier that he will get Nurmagomedov next with the fight expected to take place in September if both fighters are healthy and ready to compete. As for McGregor, he still seems to be readying himself for a return to action later this year, although there’s still no word on when he will actually step back into the Octagon again.